The Tigers celebrate after their second straight win this week. 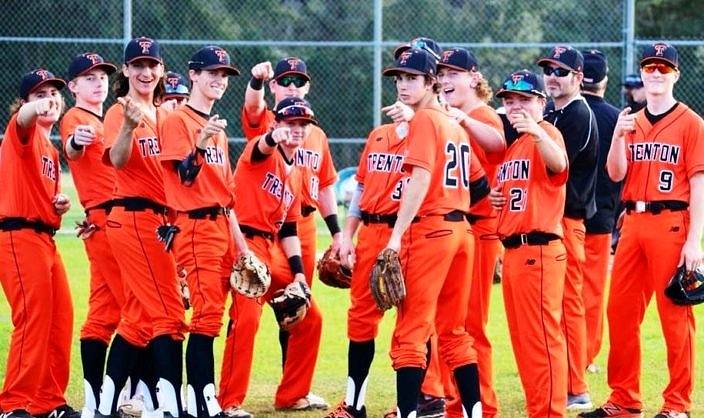 The Trenton Tigers left no question where the road to the district title will go through this season, as they secured sole possession of first place in 1A-7 following a 7-1 win over Branford on Thursday. The defending district champion Tigers (10-4) improved to 6-0 in district play and hold a nice lead over the Buccaneers (10-4), who are 7-2 in district play. Trenton grabbed the lead with a run in the first inning when Wyatt Langford drove in Chase Malloy with an RBI single, and they pulled away with a five-run second inning. Malloy came up with bases loaded after Landon Kennedy and Landon Parrish walked and Blake Hall was hit by a pitch, and he cleared the bases with a single to right field. Daniel Plank followed with an RBI double, before Langford drove him in with an RBI double as well. The Tigers added a pair of insurance runs in the sixth when Malloy and Plank both reached and scored on errors. Branford avoided the shutout with a run in the seventh. Trey Sapp doubled with one out, advanced to third on a ground out from Seth Heiderman and then scored thanks to an RBI single from Cameron Noling.